LCWA client Boise Paper has been manufacturing and distributing high-quality paper in the United States for decades, and now their story is more widely accessible to the public. 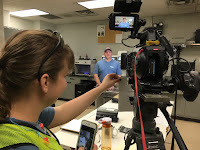 This spring, LCWA wrote, coordinated and produced a series of three videos for Boise Paper to help the company shine a spotlight on its paper making process, its people and the role U.S.-based paper mills play in supporting both local economies and national woodlands. Onsite in Jackson, Alabama, our team met workers passionate about quality products, customer service and safety – and we learned a lot about how paper is made and how demand for domestic paper incentivizes landowners to keep much of our nations’ forests healthy and thriving. Then we took that knowledge and translated it into powerful, educational brand videos. From writing the script to editing the final footage, LCWA helped capture Boise Paper’s “Paper with Purpose” mission in action – and we’re excited to now bring that story to the masses. Check out the three powerful videos we helped create for Boise Paper – Sustaining Our Forests, Paper with Purpose and People with Purpose – and stay tuned for a close-up look inside the Boise Paper International Falls Mill coming this fall!